Issue is visible on Intel Gfx, since GPU Caps Viewer 1.39. It used to work up to 1.38.2.1, and there is no issue on NVidia Gfx. It happens both on old drivers and new. 1. Launch GPU Caps Viewer 1.39 or 1.40 on Intel. 3. 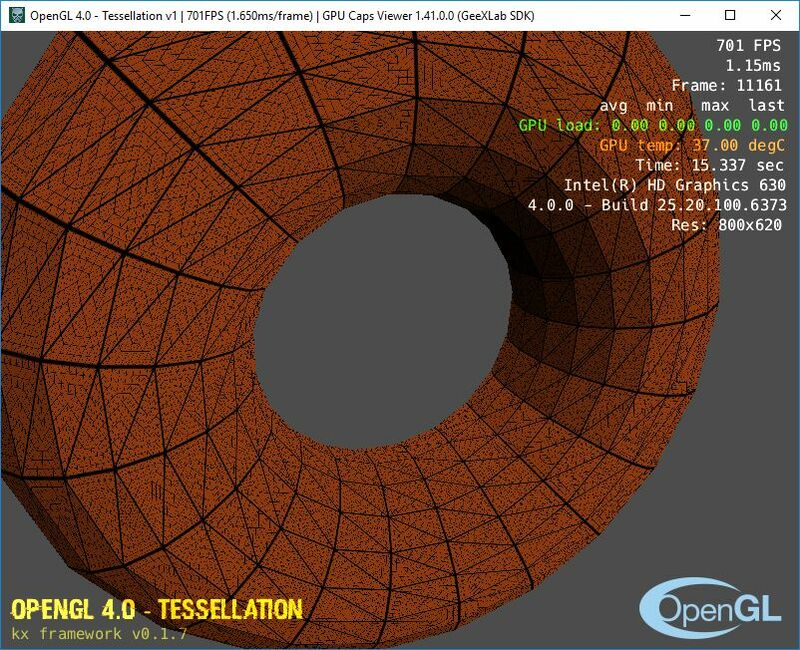 From GeeXLab demos choose "OpenGL - Tessellation v1" and click start. Result: Torus is shown correctly, but no logos and text is rendered. It looks like demo issue. I captured apitrace on NVidia and rendered it correctly on Intel. // Dorian note: What about 4.0, 4.1, 4.2, 4.3 ?? Searching in apitrace I see that wglCreateContextAttribsARB is called with context 4.0. Why it works on NVidia? I guess you get context 4.6 on NVidia when you request for 4.0. It also shows another issue of OpenGL logo rotated and centered in viewport - I haven't looked into it yet. Re: OpenGL 4.0 - Tessellation v1 - No text/logos in viewport. Thanks Dorian for the feedback. I will look at the bugs and update the demo. I confirm it's fixed in 1.41.0.